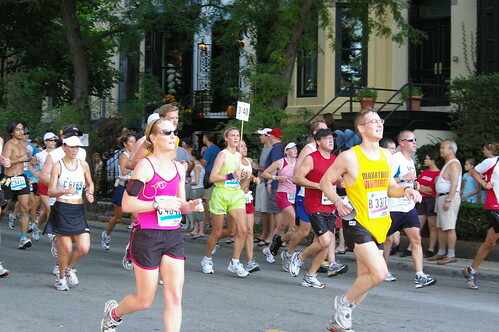 Runners sweat it out in 2007's scorcher. I feel like I've had this October planned for at least the last two years. I want to say that I've known since late 2006, after recovering from running 26.2 miles, that I'd be running the Bank of America Chicago Marathon at least through 2009. Call it stuck on a number, call it stubbornness, call it addiction (there are worse vices after all), I'm less than a week out from the race, battling through injury and poor training and excuses, yet still planning to run my 10th Chicago Marathon.